The perfect auxiliary seating for those long runs to your favorite fishing grounds or for those slow evening cruises. The seat frame, made from anodized marine grade aluminum, featuring heavy duty welded construction, is of the highest quality. The 12.5” cushion is made of closed cell foam and marine grade, smooth white or off-white upholstery. The seat when in the up position is supported by two rubber tipped legs, which fold down under the seat. The seat easily folds down, or you may choose to remove it by removing two stainless steel ball lock pins. The seat can be mounted on any vertical surface, using the two angle brackets provided. A 16” total height to top of angle bracket is required. You may also combine the folding rear seat with a backrest for optimal comfort. 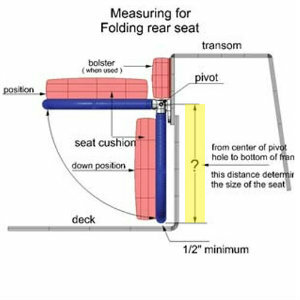 Determine Seat Width. We Offer Set Sizes in 44", 48",52", 56" & 60" Widths. Determine Upholstery choice either in Smooth Material or Pleated. Note there is a upcharge for pleated material. Aproximate radius is 8" on Fwd Rounded Corners.